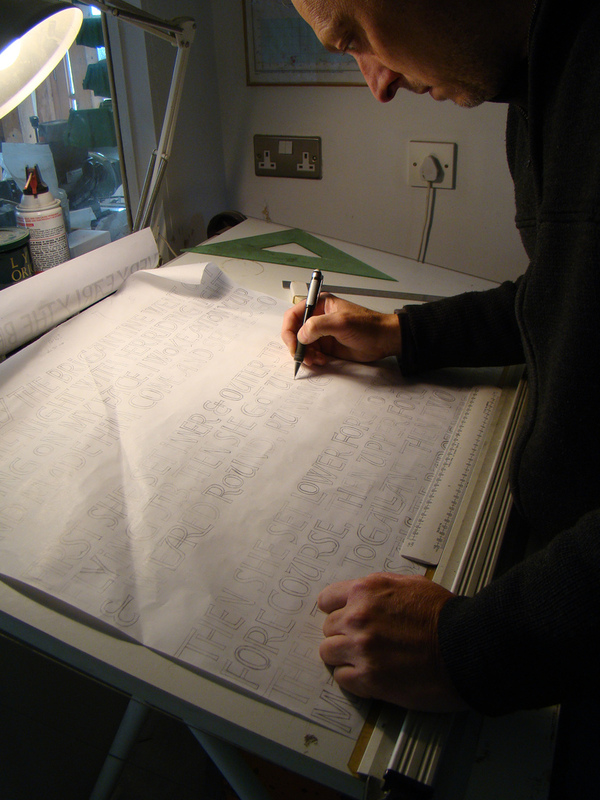 Gary studied Graphic Design in Norwich followed by an apprenticeship with the letter-carver and sculptor David Holgate. Early commissions for public sculpture came through Art in Partnership in Scotland, including the Wisdom Frieze for Glasgow’s High Court of Justiciary completed in 1995. Along with collaborative associations with architectural practises, Gary has worked for many years with Memorials by Artists, completing two major commissions through them including the Bali Bombing Memorial in London in 2005, project managed and assisted by Martin Cook; and Christ Church Cloister fountain in Oxford completed in 2010. Both projects involved the extensive design and re-landscaping of architecturally sensitive sites. Other important commissions have come through his long term association with the New Art Centre who gave Gary his first major solo exhibition in 2004. He continues to exhibit widely and was awarded the first Jerwood Contemporary Makers prize in 2008. That same year he won the prestigious Leverhulme Trust award for a 12 month residency at the University of Southampton’s Department of Archaeology. His work is in many major collections. Gary’s commissioned work can be seen throughout the UK, notably on the Princess of Wales memorial at Althorp; the Imperial War Museum London; the New Scottish Parliament; the University of Southampton; Westminster Abbey; Eton rowing lake; Chatsworth Gardens; and The Victoria and Albert Museum. In 2014 his lettering was used for a stamp commemorating the First World War and 2015 saw the launch of a new fifty pence commemorating the Battle of Britain, designed with Lee Breeze for the Royal Mint. Other recent notable commissions include the lettering and carving to the tomb of Richard III at Leicester Cathedral. Gary teaches letter-cutting in wood at the International Boatbuilding Training College in Lowestoft and at West Dean College in Sussex.